It's July and it is hot as a firecracker outside and in! I don't know who in their right mind would turn on the oven in this heat! Well, except yours truly. I had a reason behind my madness. Wanna hear it? Good....I thought so. 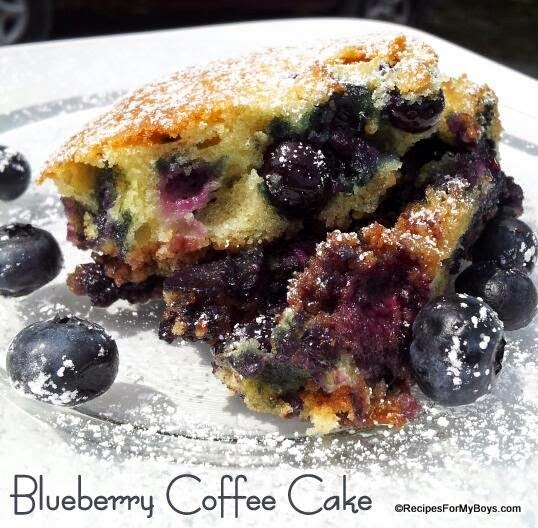 I figured, if I turned on the oven and made this fantastic Blueberry Coffee Cake for hubby and the boys, I could get a couple of breakfast meals, or snacks, out of it.....no turning on the oven a second time! Make sense? Maybe not but it was reasonable to me. A huge plus since I, one....used up all the blueberries in the fridge that were going to go bad. And two ..... I have been wanting to make this for a long time!